Kacey Musgraves On Trusting Emotion At The 'Golden Hour' Of Her Life The country singer discusses branching out from small-town nostalgia, getting married and bringing Daft Punk to classic country for her latest album, Golden Hour. 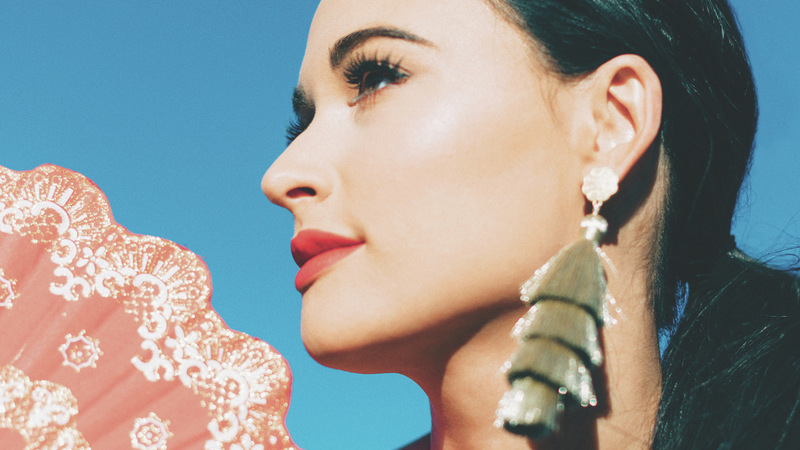 Kacey Musgraves' Golden Hour mixes her country-pop sound with disco and house. Kacey Musgraves has long been known for her classic country confessional style combined with a pop sensibility. Her first two major label albums, 2013's Same Trailer, Different Park and 2015's Pageant Material, tackled small-town nostalgia and the coming-of-age reckonings of a young woman unafraid to talk back to the world around her. Her latest album Golden Hour builds on this lineage with greater sonic and thematic maturity. The music is her response to embracing happiness after a new marriage and trusting emotion as an intrinsic part of her process. "So there we were, in the middle of making this record, and a total solar eclipse darkened in Nashville on my birthday, my 29th year," the singer-songwriter writes in the liner notes of the record. "It was the golden hour of my young adult life, and there are certain junctures that you can't just think your way through; you have to feel." Musgraves spoke with NPR's Sarah McCammon about how she hopes Golden Hour will provide light in dark times, both for herself and for her listeners. Hear their conversation at the audio link, and read an edited transcript below. Sarah McCammon: Why did you feel like you needed to write these liner notes? Kacey Musgraves: That is kind of a testament or a statement as to where my head is at right now. While people have come to maybe expect some kind of a social commentary from me, I didn't really want to go there with this record, because I just feel like people need a break from it. I feel like people are craving beauty. They're craving something real and a little bit of an escape from turning on the news. You talk about being at a juncture that you have to feel your way through. What do you mean? With this record I tried to change it up a little bit. This record to me is all about feeling. It's not about thinking as much. My prior records have been more about thinking — thinking about each line, thinking about the way that I'm flipping a phrase. And thinking is great, but if you have all thought no feeling ... I think that's a mistake. There are quite a few love songs on this album, like "Butterflies." Your first two albums had a lot of themes about striking out on your own, nostalgia for home, outgrowing small town life, and this third album, Golden Hour, is a departure from that. It feels more introspective, and maybe a little bit more complicated. Is that something that you set out to accomplish? I really tried to use a different songwriting muscle this time around on this record. Well, I definitely didn't want to do the same thing again on this record. You know, you hear a lot of songwriters say, 'Well, crap, I'm happy now; I don't know if I'm going to be able to write songs.' I actually found it to be quite the opposite. They just started pouring out and I really tried to use a different songwriting muscle this time around on this record. I've always been concerned with turn of phrase and wit and sarcasm — which I love so much, but I've proven that I can turn a phrase and I don't want to wear anybody out with that. I stepped back a little, and kind of tried to give the lyrics more of an aerial view, instead of trying to wrap every single lyric up in a bow. You've always kind of blurred the line between country and pop with your music, but this album seems like it leans into that middle ground a little bit more than your other two albums. "Velvet Elvis" sounds a lot like a pop song to me. Is that something you're thinking about when you write these songs pushing the envelope of what is country music? I never really think about anything whenever I'm writing other than 'do I like this?' or 'am I okay with singing this?' You know, I love country music so much. I don't think you'll find another person on this earth that genuinely appreciates traditional country music more than I do. But I also don't want that to keep me in any kind of a box because there's all these different sounds that inspire me. And I don't think it would be fair to myself or my fans if I just tried to make country albums every single time just to be able to say 'I'm still country,' you know, 'cause it was really fun for me to play with other sounds. There's also a lot of electronic sounds in this album; "Oh, What a World" for instance. I love the fact that it blends a country sound with kind of a futuristic sound, with the vocoder and some synthy vibes. That was really kind of a song that set the tone for the rest of the record because it was the first one that we wrote and it was like, 'Wow, OK, I want to follow this.' What is a world where steel guitar and banjo, all these intrinsic country elements, can live with some of the more Daft Punk influences in my head? Web intern Stefanie Fernández contributed to this story.